Casters allow you to move your major accessory around your workshop with ease when they are on their own stand. 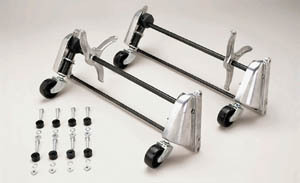 Casters mount to the legs of the stand your major accessory is on. A single step of the pedal raises the tool 1/4" off the ground for easy mobility. A double step raises it 1/2" and a third settles it back onto the ground. We apoligize, we are having supplier problems with this part only. It is due to be arriving August 1st. We are sorry again for any inconvenience.